Did changes in Earth’s environment lead to dinosaur extinction? Although the predominate dinosaur extinction theory is that an asteroid impact dramatically changed Earth’s climate, there are some paleontologists who think otherwise. These scientists believe that changes in Earth’s environment played a much more important role in the extinction of life forms on Earth and that the impact 65 million years ago just killed off the remaining species. Recent studies of the fossil record have examined changes in a wide range of plant and animal species’ populations toward the end of the Cretaceous period. Only single-celled marine life showed a sudden decline at the end of this period. Other species declined gradually, with a few groups showing no change. And there was no evidence for a catastrophic mass extinction in the fossil record. Instead, the majority of extinctions may have occurred gradually due to environmental changes such as falling sea levels and volcanic eruptions. The sea level apparently dropped by approximately 328 feet (100 meters) during this time. Also, debris from volcanic eruptions in India may have been thrown into the atmosphere. Both could have contributed to a gradual extinction of many flora and fauna species. 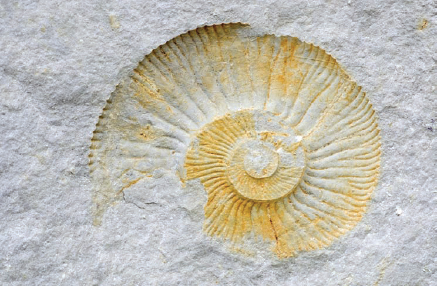 Once very common in the world’s oceans, ammonites suffered a huge die-off and eventually became extinct around the time of the Chicxulub impact (iStock).